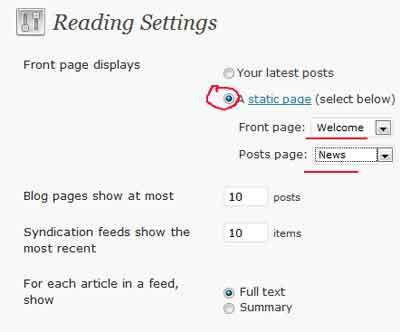 How to set up a page in WordPress 3.0 theme Twenty Ten to be a “home” tab, index page, front page or welcome static page of your blog. I have made a video how to set up a page to your own page of older version of WordPress by editing header.php or more simple by editing reading settings. But today I will guide you through how to change WordPress 3.0 page order to display front page as your welcome page or whatever page you choose that your wordpress blog will not really looking like a blog. There are people who want to use wordpress as CMS. If you use Twenty Ten, you probably notice that the “Home” tab is always labeled as “Home” unless you do this following tutorial or renaming this home tab label to something else. 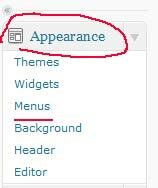 In wordpress 3.0 it is so much easier because we do not have to edit some files. 1. 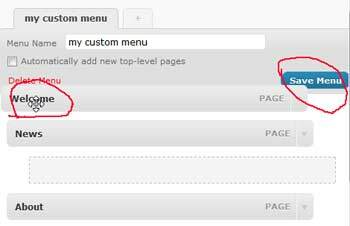 Create a page which you want to show in the front page of your wordpress blog. Admin page/Pages/Add New. Type in the title of your page and the content, click “Publish”. 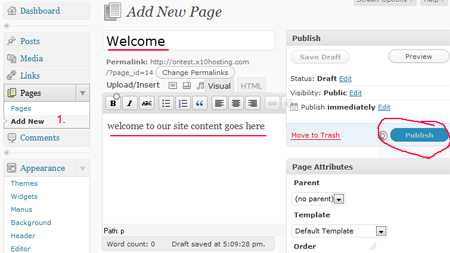 In this example, i created a “Welcome” page that will be my front page whenever people land on my wordpress blog. 2. Next step is we create another new page, to display our posts. In this example, I created a “News” page. So i typed in again the title but do not type any contents, just leave it empty and then hit “Publish” button. 3. Refresh your blog, you should see your page tabs in your navigation bar. 4. Next step is we go back to Admin/Settings/Reading. Posts page: set it to “News”. 5. Refresh your blog and you will still have “Home” tab staying there like a glue. And we don’t want that of course. 6. Next step is go back to Admin dashboard/Appearance/Menus. We are going to create menu. If you have many menus already set, click the “+” sign. 7. Menu Name: in this example, i typed in, “my custom menu”. Click “create Menu” Button. 8. Next, take a look at “Primary Navigation” in the left side, make sure our new “my custom menu” is set. 9. Scroll down until you find “Pages” box. 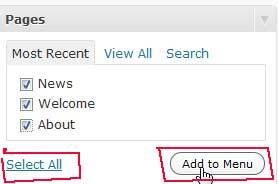 Here, you can choose which pages you want to display, in this example i want to display all pages, so i tick all, or click “select all” link, click “Add to Menu” button. 11. Refresh your blog, our final pages tabs should be perfect and displayed index page as our static page or welcome page as our “Home” tab. Thank you! Got it all working really quickly with your video 🙂 keep it up! @Marlen, Hey, i am so happy it did work 🙂 Thanks for the encouraging comment! I have searched online for hours & in WordPress to figure this out and you helped me in minutes! Well written! Well done! Well written easy to follow steps. I now am on my way to having my site looking the way I want. I agree, i love wordpress as well, good luck with your site! 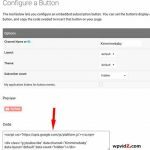 If you use another theme, this post: https://www.wpvidz.com/multiple-blog-posts-in-wordpress/ might help. Thanks for your speedy response Kimi! I ended up copying the coping the code from the loop in my categories-portfolio.php file into my index.php file, and then added a line to only show posts with the category portfolio before the loop. Kind of messy, but it was a fix that will probably be unnoticeable by most users. Well, perhaps those users less adept with WordPress. Good luck with your new portfolio. Thank you for leaving a comment Sacha! This was so easy to do, thank you! I changed the static page to one column, no sidebar as I do not want that showing on my Welcome Page. But, at the bottom of the page it still shows I am logged in and also shows the box to post comments. I only want the comment box to appear on my “Blog” page. Is that possible. I am happy you did it! i have checked your site, and to disable comment, it is easy, on the page where you have your welcome page, scroll down on “discussion” drop down menu, and untick “allow comments” option. The “you are logged in” notification will be gone as well, as it is a part of the comment template. Beside, you see it, because you are the admin which is logged in, none else can see it. I never thought of that…lol. Just want to thank you for the quick response. You’re awesome! As you know, I changed my home page to be a static page and created my other blank pages which I added to my custom menu. I have now added content to one of the pages and published it but when I go to view it, I get a 404 Not Found error. Any thoughts as to why the page is not showing up? Thanks again! I decided to post a fresh content to replace the current one in “HOME” page. I had organized and place the new content in “add new” in Admin/Pages/add new. I tried make several changes in the “menu” and “pages” widgets but not successful in my attempts. Appreciate your advice to guide me how to get the new content onto “home” page. Thanks for this tutorial . Very helpful. Thanks for leaving a nice message. Just a quick note to say “Thank you” for your great tips. I’m quite new to wp and have been trying unsuccessfully to change one page of my wp site to be my home page and have looked at so much other stuff for help. I just followed your tips and it worked perfectly first time. Thanks so much. You make online life so much easier. You’re most welcome, i am happy my post was useful to you. Thanks a lot! your post was very useful. one correction, you don’t need to create the news page, you can just leave it empty on setting and do save. It works fine without it! Yes! 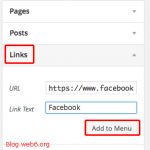 we don’t need to create a page where the posts will be displayed, but displaying blogs posts is very important for SEO. Because search engines love fresh content more than static websites. Thank you so much for this post. I searched for long time on the web to find how to change the default name “Home” to something that I want. Your method works just fine. Thanks again. I just wanted to say Thank You very much for sharing this. This is exactly what I wanted to accomplish and it worked great! thank you very much for this simple guide, it was just what I was looking for! Thank you! I battled with this problem for few hours, trying to figure out those teplate codes and stuff to fix the problem. And the solution was so easy 😀 as usual! Thanks! Thanks a lot, this helped me! Hmmm …. pretty cool. I have always wondered about static page, second option for Posts. I always left it blank as I had no idea what to add there. I am going to give these settings a try and see if that looks better than my current settings. Thanks! thanks a lot for information. very fast and clear. This tut did help me create a static front page called “Home” but it did not get rid of the dual entry “Home” – it is still there in the menu bar and also still there on the side panel. Also it places the second menu option “News” in the menu bar and also on the side menu which I do not want. Any other similar options disables comments globally, not only on the front page. About the two Home tabs, it should not happen when it is done correctly. I have tried this tutorial even on Twenty Eleven the new theme, and it did work. I have checked the link of the site that you have in the comment, and noticed it uses Twenty Ten theme, but modified. But it seems the theme is modified, so the person can modify the whole HTML structure. Thank you for responding. I know it has been modified. I modified it. But I don’t know where to change that HTML code for the “home” word. Thanks! this is very helpful. I am new to wordpress and I was feeling depress on how can i set a homepage then i found this article. This is working very well but for one small thing…. I have set up several domains in the WordPress backend. I just recently pointed a new domain to a new subdirectory and while it is showing up the way it should in WordPress, the directory is either black or now has my front page index in it. Do I need to put a physical index.html file in the subdirectory or can I get WP to to do it? I would really like to help, but I don’t understand your question unfortunately. Let’s see – after configuring WordPress, I didn’t see what I wanted as the “home page”. 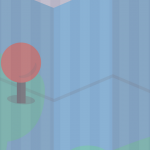 I uploaded a file to be the homepage, but I would rather it be part of the Theme I have selected. Does this only work with Twenty Ten? 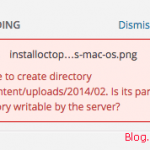 Yes, it is possible with Twenty Ten, you don’t have to upload any files. In this tutorial, the page with “Welcome” is my homepage, you can have yours differently, and then set the welcome page to be your homepage. Thank you so much! 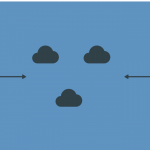 I’ve been trying to get rid of the Home tab on my blog page for ages and had read several help posts before coming across your step by step instructions. Yours was by the clearest and easiest to follow so again thank you! Thanks! Worked really nice for me. Excellent! Worked like a charm. Cheers.